Looking at temperatures of -17 C (1 F), wineries in the Okanagan Valley in Canada broke out the gloves, extra socks, and thermoses of hot coffee. The conditions are perfect for ice wine, a sweet dessert wine made from frozen grapes. Unfortunately, the conditions were not perfect for harvesting, with wind chills bringing temperatures down to -27 C (-17 F), meaning that the pickers would have a chilly night in the vineyard, risking frostbite to exposed skin. 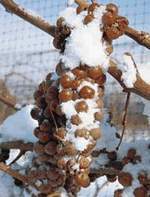 However, such hardships are the norm in the high-risk, high-reward game of ice wine.